Stay tuned for upcoming events for CPTH Charity Music Fest in near future. CPTH Charity Music Fest will take place on 9th February 2018 at Central Park Medical College, Lahore. 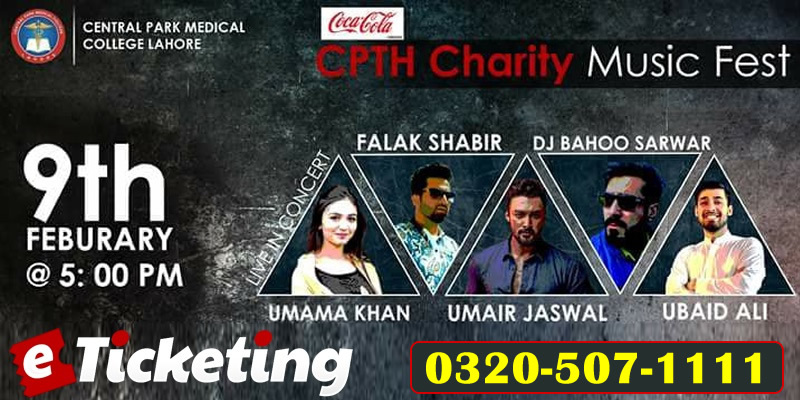 This upcoming fundraising concert and DJ night will feature Umair Jaswal and Falak Shabir. Upcoming music stars Umama Khan, DJ Bahoo Sarwar and Ubaid Ali are also performing. It is being organized by Central Park Medical College in collaboration with AXE Event Productions. Come and participate in this noble cause. Enjoy the music extravaganza with melodious beats. Best Viewed at 1024 x 768 pixels and above. This Page loaded in 0.0645 seconds on Tue, Apr 23, 2019 (20:56).